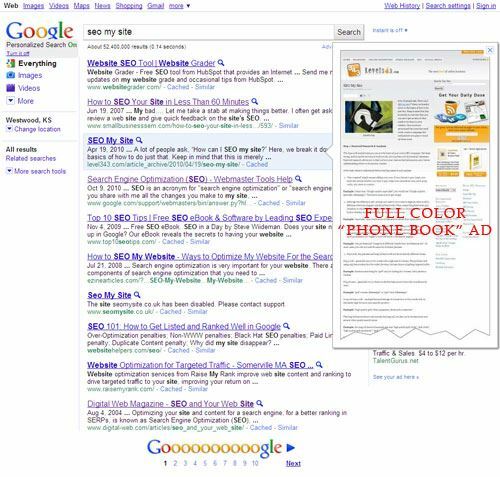 Looking for Better Search Engine Placement? Home/SEO/Looking for Better Search Engine Placement? Why? Can’t you just, you know, put up a website and get automatic clicks to your website? Well, if you’ve been a website owner for more than a few months, you already know the answer to this. Without a strong placement in the search engines, you’re always going to be scraping the bottom of the online business barrel. Before the Internet, you had the Yellow Pages. If you wanted to get your phone ringing off the hook, you had to advertise; where better, than the place most people look to find services. The Internet far outshines the Yellow Pages now, however. This is the place to find services, products, homes, cars and anything else a consumer might want and/or need. There’s a difference between the two, however. With the Yellow Pages, you had to buy the big ads to really be noticed amongst hundreds of listings; there just wasn’t much to distinguish your company from others in a long list of company names and addresses. The search engines are constantly changing – tweaking their results to give a “better user experience”. Now, whether you like the new experiences as a user or not, you have to love them as a business owner for the opportunities they present, especially if you have high search engine placement for your key terms. Ah, beautiful, beautiful SERPS. You get the chance to have an attention grabbing title (SEO My Site). Your potential visitors can star the page to come back to (white star, turns yellow when you favorite it) and see what your page looks like before they click (magnifying glass). You’re then allowed a nice little description of what they’ll find on the page. So, what you’re now looking at is a full page, full color phone book advertisement. How much does it cost to be there? It’s free. How much does it cost to be one of the first ones? That’s a whole other question. If you’re a small business owner, you’ll probably look at the prices for SEO and think, “My goodness, they want an arm and a leg!” Some companies charge according the competition for your search phrase, so if it’s a high competition phrase, it will probably cost some money. Not only can this helpful little tool show you potential problems with your site, it can also help you see where your traffic comes from, the terms Google sees as most relevant on your site, as well as a few other goodies. Recent updates from this year have added other things, like seeing how many impressions your site gets on Google for search phrases. Very useful tool for improving your site. Together, these three offerings from the big daddy search engine can seriously help you beef up your key terms. For instance, say you have a keyword you’re sure will bring in traffic, but you don’t know how much traffic. Pull up the Google Keyword Tool and search for your term. You’ll get an average monthly search amount. You’ll also get a list of other, (mostly) relevant key terms to think about. Check with Google Insights and you can see if the term is searched in your target area. Pull up Google Trends, choose your area, and you can see whether your chosen term is trending up, trending down, or showing a steady search number. If you don’t have an analytics program, you definitely want one. Google Analytics is a free program that can help you find out how your site is performing per page, per keyword, per area. This analytics program can help you find out what’s missing in your website. For example, if you’re getting great traffic but no conversions, it’s highly likely your site itself is the problem. If you’re ranking high for several key terms but not getting traffic, it’s probably your Meta data (title, description) – maybe you optimized for search engines but forgot about potential visitors. Well, in case you missed it, Google is the big search engine. Yeah, Bing has its little corner of the market, as well as a few other SEs, but if comScore is even close to right, Google still has a healthy 66.1% of the U.S. market. Globally, NetMarketShare reports an 85.78% market share for the big G. With that kind of monopoly, you can’t help but stop wondering why people are worried about Google search engine placement, vs. other search engine placements. With all of this out there, with all the handouts Google is offering and the info contained here, you can get better search engine placement. Keep in mind SEO is as much theory as it is smart decisions and known techniques. Learn what to look for and how to affect your strategy. By using these tools, you have a whole golden cache of goodies – you’re a powerhouse, with just enough information to be dangerous. Have we forgotten any helpful Google tools for SEO?